I apologize for not having a pithy and thought-provoking post this week. I’m actually working on a couple different ideas, but was interrupted by a couple days of good prescribed fire weather. We had a long day yesterday and today looks like it’ll be another. I can at least post a few photos from our fires yesterday. We completed a fire in one of our restored prairies that will be grazed this year, and then had time to light off a small island in a nearby restored wetland. 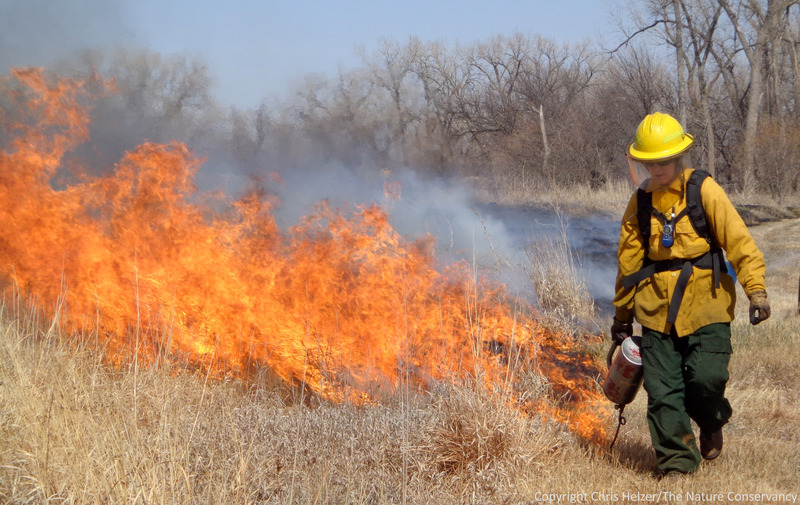 Mardell Jasnowski lights the headfire near the end of yesterday’s prescribed burn in a 2001 prairie restoration. The Nature Conservancy’s Platte River Prairies, Nebraska. Big flames from tall grass. The burned area will be grazed intensively by cattle this season while unburned areas will receive little grazing pressure. 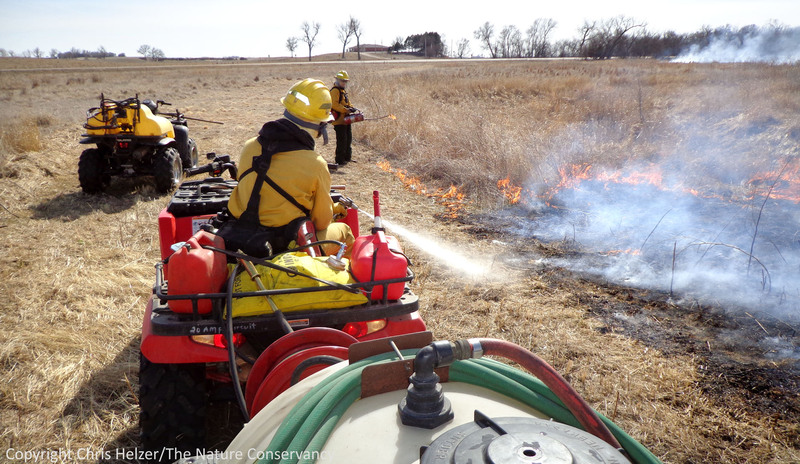 Burn crew member Aric Ping keeps the fire inside the mowed firebreak with a high-pressure spray of water. Fire burns on a small island in a restored wetland. The burn will encourage shorebird use this spring, suppress the growth of willow trees, and make it easier for us to find and control reed canarygrass this summer. 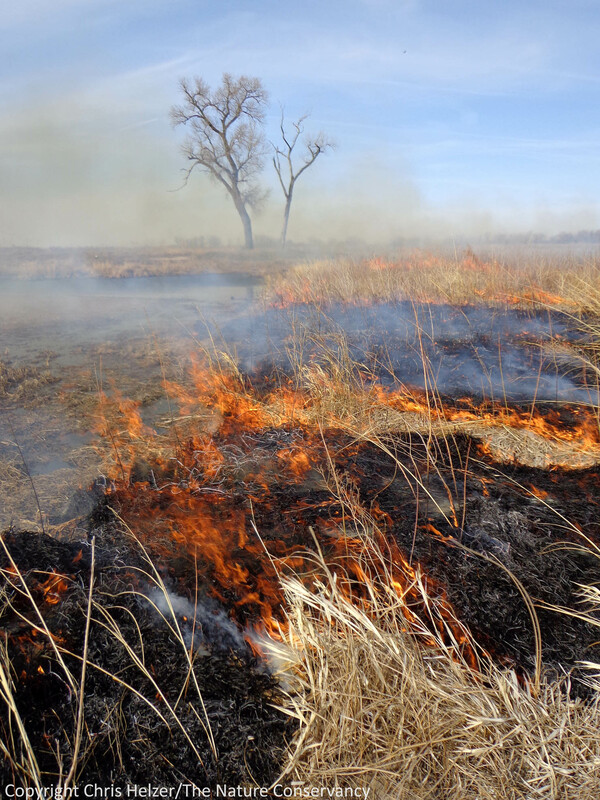 This entry was posted in Prairie Management, Prairie Photography, Prairie Restoration/Reconstruction and tagged controlled burn, fire photography, grassland, nebraska, photography, platte river, prairie, prescribed burning, prescribed fire photos, the nature conservancy, wetland by Chris Helzer. Bookmark the permalink. Nothing smells better than your clothes after good controlled burn in the spring or fall! I miss those days! – Do you add a surfactant to the water you used for maintaining fire lines? – Looking forward, when you have time, to a more precise description of “grazed intensively”. Hi James, No surfactant, just high pressure. Seems to work well, though some of our partners do use surfactant. Good question on grazing. The entire restoration is 68 acres. I think the plan is to have 6 cow/calf pairs on the site from about mid-April to Sept 1. That’s not very heavy, but we hope the grazing will be largely concentrated on the burned half. My hope would be that the cattle would hit the grass pretty hard but not graze most other species. The drought will affect things, of course, so we’ll watch and pull the cattle out early if we need to. This is a site that we’ve been grazing about every other year, giving it complete rest in addition to the (mostly) rest the unburned portion gets when we do grazed it. There’s a deep wetland on the site, so we’re being a little more cautious about annual grazing – and it’s one of multiple sites in which we’re trying various grazing/rest regimes. Very nice pics. Keep up the great work. Would like to see how the grass varies in a drought. So more pictures on this subject will be nice later on this summer. Thanks Todd. Or you can just stop by and take a look this summer! Are your high pressure pumps the piston type? Dennis – no, they’re diaphragm pumps. Can’t draft with them, but they work great. We have 120 gal sprayers and can get through a burn with that much water most of the time, but we have water tender trucks on hand to re-fill them if needed, so don’t need to draft. Putting Aric to work…. good! We mow closely around the area to be burned and wet the area just ahead of as we start a backfire. We’re too close to a big timber. Our problem is a consistent wind as we are in a valley and the wind shifts constantly so it’s hard to predict the direction of the wind. We usually wait until we can get a consistent wind from one direction but they always seems to change in the valley. It is very tricky and a bit scary at times but we have managed to control it for 25 years and it has only escaped on us twice. Fortunately we were able to get ahead and rake a line in the timber and set a backfire. It seems so odd for you to be burning when we, so far south and east, were stuck with snow! Really set me behind but it’s gone now and, after one more chill, may be able to get to burning and seeding. Great photos, as usual. Anxious to start burning here. The Smooth Brome and Fescues are popping up!